To prevent catastrophic overheating of the planet, there must be a rapid transition to a clean energy economy. Our water, air and workplaces must be protected from pollution, and companies must be discouraged from fleeing to countries with weaker health, safety, and environmental standards. “How humans interact with nature is intimately tied to how we interact with each other. Those who are relatively powerful and wealthy typically gain disproportionate benefits from the economic activities that degrade the environment, while those who are relatively powerless and poor typically bear disproportionate costs. All else equal, wider political and economic inequalities tend to result in higher levels of environmental harm. For this reason, efforts to safeguard the natural environment must go hand-in-hand with efforts to achieve more equitable distributions of power and wealth in human societies.” — James Boyce, Is Inequality Bad for the Environment? Scientists tell us the earth is warming and that it is directly linked to the dawn of the industrial revolution; therefore human activities are a major contributor to global climate change. As financial strip-mining proceeds relentlessly, corporate expenditures on health, safety, and environmental controls are diminished. As financial strip-mining reduces tax payments by corporations and the wealthy, public funds for green investments vanish. The pressure for stock buybacks reduces corporate funds that otherwise could, and should, be used for significant green investments (as the hedge fund raid on GM cash reserves clearly shows). 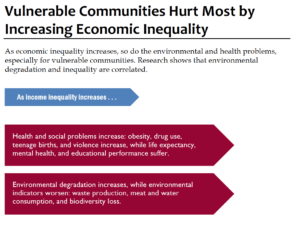 Studies show that the higher the level of inequality, the more environmental degradation, especially for those at the bottom of the economic ladder. These facts provide strong reasons why environmental and environmental justice activists should join a common effort to fight Wall Street and reverse runaway inequality.